Pack Conveyors are used for a variety of materials and packs which require speedy transportation and are heavy which increases the attraction of pack conveyors as for packaging and material handling industries. Pack conveyors are generally easy to maintain on account of the system being equipped with low consumption motors. Pack conveyors are used for the handling of goods to create intelligent packaging system by connecting multiple single functioning machines. The use of pack conveyors gives process flexibility and improved performance. Requirement of type of conveyor system for the transfer of each package are determined by peculiar package features and specific single machine to machine requirements. Pack conveyors are for high automation purpose of a manufacturing unit or line that converts a group of machines to a plant with high efficiency. Pack conveyors market is anticipated to record a CAGR of 6.2% over the forecast period. Pack conveyors market is expected to reach the value of USD 12 billion at the end of the forecast period. Many multi-national companies are concentrating towards new product advances in pack conveyors. Moreover, the many advantageous properties of pack conveyors are exploited in the field of industrial goods management now and then. Currently the global pack conveyors market is observing vibrant growth owing to increasing demand of industrial automation in the market. Advancements in manufacturing industry in the past few years and growing technological explorations is projected to drive pack conveyors market besides the wide range of functions of pack conveyors in an immense range of products such as milk bottling, candy and cookies packaging, medicine packaging and more during the forecast period. On the basis of regional platform, global Pack Conveyors market is segmented into five major regions including North America, Europe, Asia Pacific, Latin America and Middle East & Africa region.As an industrially developed region with highly automated industries, North America is panned to observe substantial growth in pack conveyors market on the back of rising pack conveyors usage in consumer goods market. North America is expected to be followed by Asia Pacific in terms of consumption due to expanding pack conveyors requirements in growing manufacturing and assembling industries. On account of multiplying pack conveyors uses in growing end-use industries such as pharmaceutical, consumer goods, food and beverages, cosmetics and others, Asia Pacific is budding as a regional pack conveyors consumption market. The rising demand for pack conveyors for various assembly processes in pharmaceutical, food and beverage, diary, automotive, aerospace and other industries are expected to drive the market rapidly over the forecast period. Rapid industrialization with economic development and thriving manufacturing sector is expected to boost the pack conveyors market in the developing regions. Additionally, increasing urbanization is creating higher pressure on food and beverage produce leading to requirement of speedier assembling equipment which is fulfilled by incorporation of pack conveyors in the plants that is anticipated to propel the pack conveyors market sturdily over the forecast period. Pack conveyors provide protection against chafing and friction while being transported and are speedier than manual goods and packaging process handling resulting in significant contribution for pack conveyors growth over the forecast period. Moreover, pack conveyors offer durability of handled goods from light weight to heavy weights with ease of operation and all the components assembled intact in the packages providing high efficiency in the manufacturing process. This factor that is meant for eliminating human errors is estimated to serve as a key factor in the growth of the pack conveyors market across the globe. Furthermore, innovation in pack conveyors offering single and multi-way transport in various types such as, slat conveyors, belt conveyors, and roller conveyors, and others is predicted to help the pack conveyors market expand strongly. 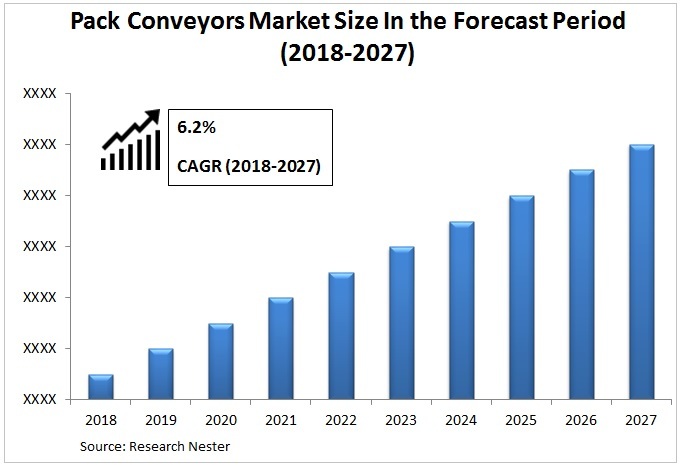 However, presence of single units of dividers and pelletizers at lower unit costs is anticipated to sluggish the pack conveyors market growth due to lower adoption from the manufacturers of developing and under-developed countries over the forecast period.